The CSV Manager provides an user-friendly way to bulk import, export, and update the location data. You can import the address, opening hours, store categories, featured images, custom meta fields, and other details for multiple locations via a CSV file. If no coordinates are provided, then the location is automatically geocoded *. 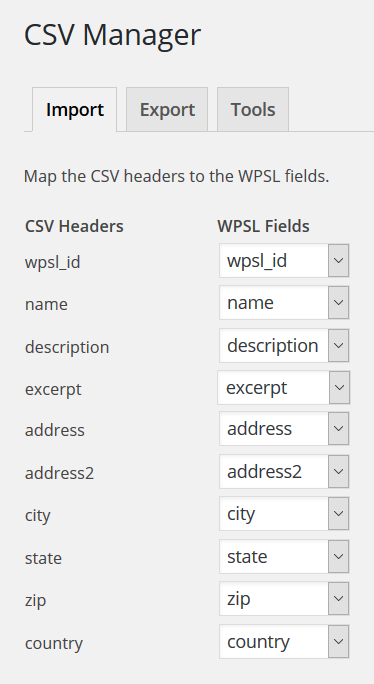 After you have uploaded the CSV file, you can map the CSV headers to the WPSL fields. This is done automatically as long as the CSV headers match the names of the WPSL fields. The exporter enables you to export all the locations at once, or use one of the filters to export the locations by category, city, or country. If you want to update existing locations, you will need to first create a CSV export, then update the data, and then re-import the updated CSV file. * Restrictions exist for usage of the Geocoding API. Added: Show a preview of the CSV data on the mapping screen. Added: Make it possible to check for duplicate locations on import. A location is a duplicate when the name, address and city match with existing location data. Added: If only the wpsl_id is set in the imported csv file, then the matching locations are deleted from the database. Added: A wpsl_csv_skip_required_check filter to optionally disable the check if the required fields are set. Added: Support to import tags ( the WPSL plugin itself will have support to filter the search results by tags with the 2.3 update ). Added: A wpsl_csv_filter_options filter to make it possible to include custom dropdown filters on the export page. Changed: Automatically flush the auto load transient cache after importing new location. Changed: Call wp_defer_term_counting & wp_defer_comment_counting to improve the import performance for large amount of locations. Changed: The notice after the import now shows the amount of imported, updated, removed or skipped locations. Changed: Minified the CSS/JS files loaded in the admin area. Fixed: A problem with the country iso codes using an invalid data format since the 2.2.10 update from the WP Store Locator plugin. Fixed: Compatibility issue with PHP 7.1+. Fixed: Spaces in CSV headers breaking the field mapping. Fixed: Prevented the import from breaking on hosts that uses object caching. Fixed: Made sure terms exist before running wp_update_term_count_now. Otherwise a SQL error shows up when all the locations are bulk deleted. Via Benjamin Borowski. Added: A tools section where you can bulk delete all existing locations. Added: The option to export locations by state. Added: Three new capabilities for the Store Locator Manager role ( wpsl_csv_manager, wpsl_csv_manager_export and wpsl_csv_manager_tools ) that lets you restrict access to the different sections of the CSV Manager. Added: A check if the required fields ( name, address and city ) are set after uploading the file. If not, then an error notice is shown. Changed: The opening hours are only included in the export file if they are enabled on the WPSL settings page. Changed: Use get_sites instead of wp_get_sites for WP 4.6+ sites. Fixed: A foreach error that was triggered by incorrect opening hours data during an export. Changed: Order the items in the export dropdowns alphabetically. Fix: PHP 5.2 compatibility issue.